How do I access MME effects’ internals? How can I setup MME effects to be more flexible? How can I fine-tune the settings of an effect? In which way can I modify Beamman’s Burner effect? So, you’ve downloaded your new shiny Beamman’s so-and-so effect, and now you eagerly attempt to use it in your presentation. You attach it to a Dummy Bone, move it around, play with its Si and Tr settings… but for some reason it’s not exactly what you expected. It surely looked more flashy on NikoNiko. Somehow you feel that you don’t unseal its full potential. Of course, this is most probably true. Each effect has lots of parts in its script that can be tinkered with, allowing it more flexibility. Earlier we learned to use accessory’s settings in order to setup some of effect’s internal parameters from AMP panel. This tool is limited, though – it has a finite amount of fields that can be used, and more often than not a bigger part of them can’t be used because messing with accessory’s position and rotation fields may shift the visual effect in an undesirable way. Fortunately, there’s a way to have as much control over .fx’ parameters as you desire. Today’s case study will be Beamman’s Burner effect – download it from its homepage and open “burner.fx” in a text editor. I chose this effect because it is rather simple-looking, all changes to it become immediately obvious on MMD screen, and it is relatively friendly to the sort of editing I’m going to describe. There are many more definitions like these in this script, but you get the picture. Most usually, effects start with a block of definitions for main parameters that the effect uses, and these numbers can be modified to change way it looks without harm to functionality. Lines starting with “#define” we will ignore for now. While they can be modified by editing the effect as a text file, it’s impossible (or, at least, inadvisable, for effect’s author probably had reason to declare them this way) to transform them into full-fledged controls, which is our goal. The rest, though, is more interesting. While the code might look intimidating for those who never had to deal with programming, there’s actually nothing complicated at this point. In fact, each of these pieces is just a glorified way to say something like “float particleSpeed = 5” (and many effects just do). It doesn’t really have an impact on the MME engine and is simply a sign that the effect was primarily created in some professional tool (for example, NVIDIA FX Composer) and then copypasted as a MME script with minimal adaptations if ever necessary. There, detailed descriptions like these indeed make sense, as they allow to use convenient tools to adjust their values easily. For MME, though, only actual numbers are essential. Load the Burner effect into MMD and spend some time playing with these numbers to better figure their purpose. After some experimenting, I gathered that the effect comprises two equal sheafs of particles (it may be difficult to notice at first, since their respective variables are listed in creative disorder), each with a set of parameters defining their shape. The “particleSpread” variable defines the angle at which those particles are spread from the emission center. The “particleSize” variable sets not so much physical size of the effect but the intensity of light in its sheaf. The actual size is defined by “MinMoveSpd” and “MaxMoveSpd” that set limits to dispersion of individual particles’ lengths. Each of these is duplicated for two sheafs (that is, “particleSpread” and “particleSpread2”, etc). There are also “ParticleColor” and “ParticleSpeed” variables whose purpose must be obvious. (“CutSpeed” and “Grv” are not used). Just editing these variables in the .fx file allows us to shape the Burner in a way we like (and also gives you a clearer idea what the hell I’m talking about, in case this paragraph already started to give you a headache :) ). In order to truly exert control over the effect, though, we’d have to transform them into actual tools that would be available straight in MMD. But how? There are too many of them, for starters! The “name” parameter here refers currently to the instance of a body the .fx script is attached to. And, as we used to attach effects to accessories, the operator only has access to properties of an accessory (in this case, the Size parameter that is provided by AMP), which are few. By setting the name of a *different* object, though, we can inspect that other object’s properties as well. And, unlike accessories, .pmd models have unlimited amount of elements whose values can be accessed and used as a variable in the script. For an effect with lots of parameters this can be a big advantage. We can create a dummy .pmd model, add some named elements to it, and then refer to their names as to our script’s controls. EDITOR’S NOTE: The WordPress engine used by LearnMMD site edits the posted text as it finds necessary; I can not control it. In particular, it changes straight ASCII double quotes into Unicode curved ones that MME script interpreter does not recognize. If you want to copypaste code fragments from this page into your own script, make sure to fix them back. What does it mean? When seeing such a command, the script interpreter assumes that a) somewhere among models loaded into MMD there’s a model named “burnerControl.pmd”, and b) among its bones or morphs (aka “facials”) there’s one named “Speed” (we could give it the same name as the variable, but you’d want to see more comprehensible titles when you’re working with your effect in MMD). If it were a bone, values that that could be read from it would be its coordinates and/or rotation angles. We’ll stick to morphs, though, as MMD provides convenient sliders for them in the Facial Manipulation Panel. So: if we have a “Speed” morph in a “burnerControl” model, its slider position will be scanned in real time and instantly assigned to our “particleSpeed” variable. The balance is restored now. Don’t forget to remove the original description of particleSpeed from the beginning part. Then find the place it is used… what’s there? All right, this might be a bit confusing if you’re not a programmer, and not really typical to many effects. Did I mention that the Burner consists of two *identical* sheafs of particles? Well, except for numerical parameters that describe their respective shapes, they are. What the code above does is allow to re-use the rest of the procedure twice, one time for a first sheaf, and then for a second, simply by substituting its variables. So we’ll have to create control gauges for these four variables as well, but won’t do anything else about them – they are already taken care of! That covers changes that we need to do to the script to make it listen to our sliders. Save the script under a different name, like, “burnerPro.fx” and make a copy of “burner.x” named “burnerPro.x” as well. Time to prepare a steering wheel for our effect. Launch PMDE and start a new model. Create a Primitive (no matter which one) and make it invisible by collapsing its size to zero. It won’t matter for the actual effect, you’ll only need it as a placeholder to create morphs. Now go to the main window and select “Expression” tab, right-click on an empty list, and hit “New look created” (“Morph” and “New morph create“->”Vertex” if you didn’t switch off PMX mode). An additional “Morph edit – Add new” window will appear. Make your model’s vertices visible by hitting the “green cloud” button in the lower toolbar, select them with the mouse, and drag aside a bit. Then click “Reflection” button (the “Differences” label should change from 0 to some other number), and click “Add New”. Congratulations, your model just flashed its first smile at you :P.
They should match values of “string item” parameters of your definitions rather than respective variable names used it the script. Also, you can distribute morphs to groups (eye, brow, lips, other) to as you find it comfortable. Fill the “Model name” tag to remember what the model does when seeing it in the list, and save the model as “burnerControl.pmd”. So, what is the lesson of today’s exercise? Is it about how to get a new and improved Beamman’s Burner? I should certainly hope not. The real point is, lots of effects can be tuned simply by altering some numbers in their headers, changing their appearance and making them look more closely to what you *want* to see rather than what you get simply by using the effect as is. And doing so with a real-time tool rather than fiddling with the script manually not only makes finding your “look” easier, but also allows you to provide a completely new quality to the effect: change its looks on the fly, producing dynamic visuals not possible with a “static” effect (not to mention having a single effect for all videos that use it rather than producing and cataloging each variety you may need). While making a MME effect on your own may look difficult and beyond your skill, you don’t actually have to be a programmer or know a single program language in order to do necessary changes for an existing one. Once you learn few simple patterns and attain understanding of what you’re doing and why, many effects that used to have a fixed view will bloom with new colors. Remember: for a really inquisitive mind, sky is *not* the limit! 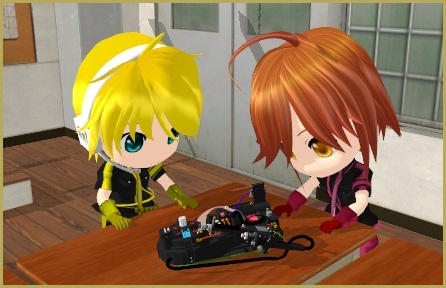 Models used in illustrations: Chibi Len and Meiko by MMD-francis-co, Classroom interior by MMDFakewings18, the gizmo they are looking at is Ghost Trap from GhostBusters Pack by OniMau619. The final model is a combination of Nakao base and Office outfit by 2234083174 (recolored), and hair by MMDFakewings18. Half-Lambert shader by kyaami is used for illumination. you have the model (rather than accessory) with the same name as the script, which causes MME to load the latter automatically. in CONTROLOBJECT’s definition, you refer to it as string name = “(self)”; thus making the engine to look for necessary control elements in script’s “own” object. instead of attaching the accessory to a Dummy Bone, as you do with most other effects that need positioning, you move the model itself by its Center bone. As a different example, there’s a series of effects by HariganeP: ActiveParticle, ActiveParticleSmoke, ActiveParticleFire, ActiveParticleLight, JetSmoke, etc. Each of them has an additional set of accessories: BackgroundControl.x, TimeControl.x, and SmoothControl.x. They serve basically the same purpose as the .pmd control unit described above (except that each of them controls only one aspect of an effect, whereas the model approach allows to gather all controls under the same hood). What is interesting, though, is that one loaded instance of an accessory controls not just all instances of an effect, but *every* effect in the series that supports it. That is, you may fill your scene with ActiveParticleFire, ActiveParticleSmoke, and JetSmoke, and then setting “Tr” to zero in TimeControl.x stops action for the whole scene at once. In the next episode: Care to dance? Use the technique you’ve just learned in collaboration with external programs like VMDSpectrum Analyzer to enhance your effects even further!